DENVER — Old Man Demaryius turns 30 this year. “I think it’s, uh, next year,” Thomas said with a let’s-change-the-subject laugh. Where does the time go? They grow up so fast. Perhaps age is just a number. But in football years, the big 3-0 is a big one, indeed. On the way to DT’s kids camp at Mullen High School — 250 little fellas horsing around like hooligans, none more so than the Big Fella, DT — it occurred to me: His good buddy, Calvin Johnson, retired from football at 30. What does that mean for Demaryius? Megatron unplugged after six straight seasons of at least 1,000 receiving yards (DT is working on his sixth straight) and with few peers at wide receiver (DT’s streak is the longest in the NFL). Hmmm. With no other reason to ponder the "R" word, it still was worth asking: How much longer, DT? It’s always different at Dove Valley. At quarterback, the story goes from Orton to Tebow to Peyton to Brock to Peyton to where we are now, Trevor Siemian and Paxton Lynch. At head coach, in Thomas' time, McDaniels to Fox to Kubiak to Joseph. On the receiving end, the one constant is DT. Only three NFL players ever had five straight years of 90 catches and 1,000 yards: Torry Holt (six straight from 2002-07), Marvin Harrison (five straight from 1999-2003) and, yes, DT (five and counting). In 2010, Denver drafted Demaryius four picks before they took Tim Tebow. They found a cornerstone before Josh McDaniels had his cover blown. Now there are two Broncos left standing from the 2011 draft (Von Miller, Virgil Green), one from 2012 (Derek Wolfe) and none from 2013. Thomas is the only one left from the 2010 roster, the longest-tenured Bronco. Time flies. 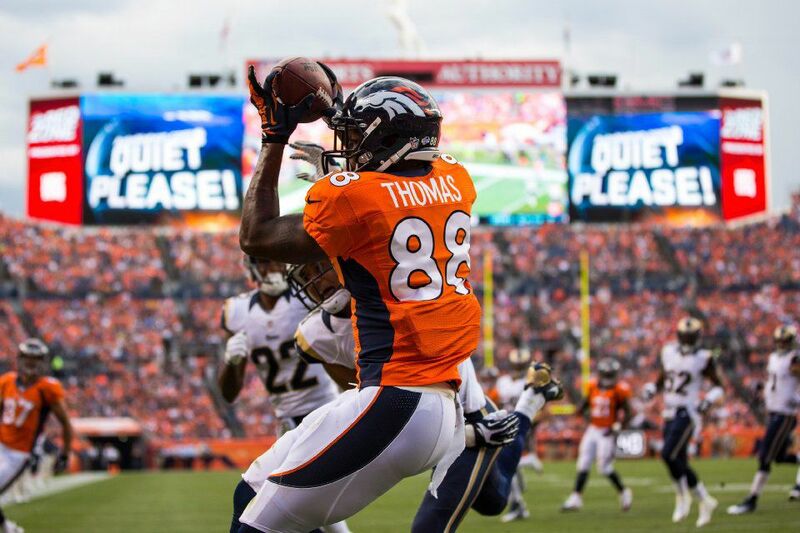 Thomas is on pace to be the best wide receiver there’s ever been with the Broncos. If he stays healthy as a horse, Thomas will pass Rod Smith with the most receiving yards in club history midway through the 2019 season, the final one of his contract. He’s supposed to make $14 million that season, which would be his 10th here. Not even Megatron played a full decade with the same team. So, well, you never know. The odds are stacked against it. Demaryius Antwon Thomas (DAT guy) hasn’t missed a game in five full seasons. That’s the stat that stands out. He played in 17 games in the 2012 season, 19 in 2013, 17 in 2014, 19 in 2015. How? Thomas says his clean bill of health stems from a long-ago conversation with ex-Broncos Brian Dawkins and Champ Bailey. They told him what to eat (schools of salmon) and how to train. Dawkins and Bailey should run a football camp for adults. Their health plan has worked wonders. Ah, the quarterbacks question. We can’t talk Broncos without it. Thomas played with four QBs at Georgia Tech (where he was teammates with Calvin Johnson, and Thomas has said Johnson is “the reason” he went to Tech) and six starting QBs in Colorado. DT said Trevor Siemian is the more vocal candidate. “You know Paxton’s still young” in the leadership department, Thomas said, and every department. The offense still needs a leader. Broncos coach Vance Joseph has said the quarterback competition could go until the end of the preseason. I doubt it. This is Thomas’ third quarterback conundrum with the Broncos, after the Peyton-Brock melodrama and Tebow-Orton mega-drama. DT knows when to call the fight. “About a week and a half into training camp, before we go to San Francisco,” Thomas said. The Broncos will practice with and against the 49ers in San Francisco (in Santa Clara, actually, near the site of Super Bowl 50) on Aug. 16-17. They play a preseason game there on Aug. 19. “It does make a big difference” when the coach, or John Elway, chooses the quarterback, Thomas said. “It’s totally different. In the meeting rooms it’s different,” Thomas said of the post-Peyton era. “Of course, Peyton is the master of timing. Those young guys are learning. They haven’t been around it. Peyton just knew it. He could talk to any receiver. That’s the advantage he had. To make the playoffs, the Broncos need DT’s greatest hits. They need him healthy, happy and hoarse (from speaking up in the locker room and huddle). They need 1,300 yards (his total in Manning’s final season, in an offense that sometimes sputtered) and nine touchdowns (his average over the past five seasons, a fair sample size). They need his old-man strength and know-how.